Vanessa Redgrave and Terence Stamp star in a lovely, poignant film that deserves far more attention than it's been given. UNFINISHED SONG is a 2012 movie that never played in my town, possibly never played in yours either. It's now playing on Netflix Streaming, though, and I urge you to add it to your queue. Heck, don't just add it to your queue — watch it this weekend! UNFINISHED SONG was originally titled "Song for Marion," which seems a far more appropriate title. Vanessa Redgrave brilliantly plays Marion, the terminally ill wife of crabby, curmudgeonly Arthur, perfectly played by Terence Stamp. Arthur isn't crabby just because Marion is dying yet continues to shine and find joy in life. No, he's always been a crab — since day one of their decades-long marriage. His attitude stands in the way of appreciating to the fullest his final days with Marion, as well as his relationship with his only son, James (Christopher Eccleston), father of his only grandchild. Arthur's attidue also prevents him from appreciating Marion's need to participate in a choir of older folks, led by volunteer choir director Elizabeth (Gemma Arterton), who delights her singers with unexpected — and unexpectedly hip and metal — song selections. Arthur thinks Marion should take it easy in her final days... and, especially, not make a "fool" of herself singing in front of others. Eventually, though, Arthur surprises himself — and everyone else — when he reluctantly seeks participation in the choir. Paul Andrew Williams, writer and director of UNFINISHED SONG, masterfully weaves family dynamics, the loss of one's soul mate, loneliness, and determination to find joy despite sorrowful circumstances into an uplifting, heart-touching tale. Music is magic, and music binds the characters of UNFINISHED SONG in magical ways and creates an unexpectedly delightful film. 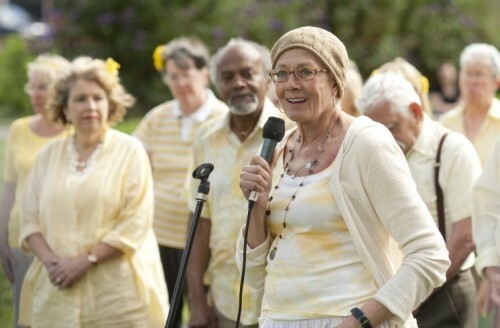 VANESSA REDGRAVE stars in UNFINISHED SONG Photo: Nick Wall / © 2013 The Weinstein Company. All Rights Reserved. Vanessa Redgrave exudes pure joy as she bravely tackles Cyndi Lauper's "True Colors," eliciting streams of tears from my eyes as she sang for her Arthur. And that wasn't even halfway through the film! Terence Stamp then proves an even more masterful singer — and tearjerker — as he sings his heart out for his beloved Marion. All the other musicians and musical numbers in the movie are fabulously fun and keep the film balanced on the side of delightful rather than depressing. Gemma Arterton proves a true gem as the choir director in UNFINISHED SONG. She's full of light and love and is an actor whose films I'll surely seek out going forward. And I enjoyed seeing Christopher Eccleston play James, a kind and good man rather than yet another shady character as he most often seems cast. His heartache at what's happening with his mother and the lack of love from his father seemed palpable, his eyes and facial expressions revealing far more than his words. It's not often that I laugh and I cry in equal measure when watching a film. Such was the case with the equally humorous and touching UNFINISHED SONG, though. Plus, it provided plenty of fun and poignant earworms that will — like the film — stick with me for days. UNFINISHED SONG (rated PG-13 for some sexual references and rude gestures) was released theatrically in 2012 and earned nominations for several film awards. The movie is available now on DVD, Blu-ray, Netflix streaming and other digital options. Find out more on the film's official website.